Q. Do you still have entries? Yes, we have entries for the October 13, 2019, Bank of America Chicago Marathon. Start the process. Use promo code FAQ to receive $10 off our registration fee and pay just $89. 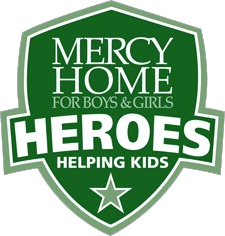 The Mercy Home Heroes will cover your $205 race entry fee. If you have an entry to the 2019 Chicago Marathon, there is no cost to join the team. Q. Once I register for your team, am I in the race? No. After signing up, you will receive an email with a unique link to register for the race as part of our team. You will be asked for credit card information but will not be charged. Mercy Home will approve your entry and pay the fee once you complete registration. Q. What is the fundraising minimum? The Chicago Marathon has set the fundraising minimums for all charities. Runners who register before November 29, 2018, are required to raise $1,250, while runners who register after that date are required to raise $1,750. Runners with their own entry are responsible for raising at least $600. Q. How do my supporters make a donation? Q. What if someone donates cash? If they want a tax receipt and acknowledgement of the gift, the best method is for you to write a check and attach their information to it. Q. Do matching gifts count toward my minimum? Because every company distributes matching gifts differently, we suggest you use them to supplement your fundraising rather than relying on them. Be assured that gifts will be credited to you once they come in. Q. What is the deadline for my minimum fundraising commitment? The deadline to meet your fundraising commitment is October 6, 2019. Q. What if I don't meet my minimum by October 6? You must submit payment for the remaining difference (fundraising minimum minus amount raised) before the marathon expo on October 11-12 or your race bib will be pulled. Q. What is a bib pull? The Chicago Marathon asks all charities to submit a list of runners who haven't reached their fundraising minimum by Friday, October 4. Runners on the "bib pull" list must come to the Mercy Home Heroes tent at the Expo to settle up and obtain a signature to receive their bib for the race. Failure to do so means you will not be allowed to participate in the race. Don't see your question here? Email Heroes Coordinator Jim Harding at jimhar [at] mercyhome [dot] org for answers.